On Sunday 30th April, RMTC was challenged early by MCC and trailed 0-3 before Vince Scopelliti and Kathryn Arndt registered their first wins. Stirred into action, obviously after some late Saturday nights, the RMTC team levelled the score at 5-5 prior to the scheduled lunch break. While waiting for the shepherds pie to heat it was agreed by all that some wine be imbibed to the supplement the handicapping system. This clearly was to RMTC’s favour, romping home with a clear 9-5 victory. 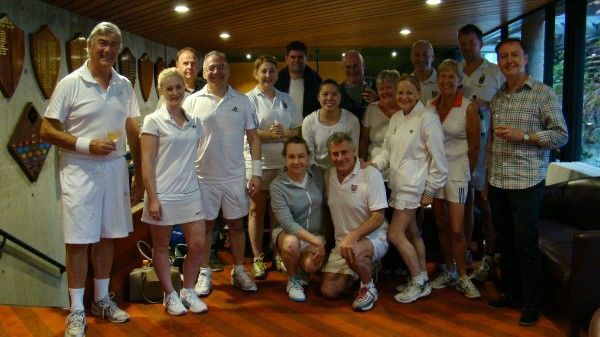 MCC was represented by: Wendy Whitehead, Tim Raw, John Mackinnon, Judy Collins, Matt Downey, Mike Carroll, Yvonne Rout, Greg Henderson, Annie Strange, David Cutler and Vince Scopelliti (yes - he played for both teams!). The RMTC team included Jo See Tan, Richard Simpson, Annie & Geoff Dempster, Fred Kininmonth, Alasdair Norton, Vince Scopelliti, Kathryn Arndt and Annie McAuley. Thank you to Wendy for coordinating the MCC team, Liza for preparing such a delicious autumn lunch and of course the pro’s - Frank, Kate and Henry - for marking. It was a fun day.